Justin Majeczky captured this stunning image of the Milky Way over South Lake Tahoe in June 2015. A long, exhausting hike near Lake Tahoe was worth the effort for one dedicated astrophotographer. 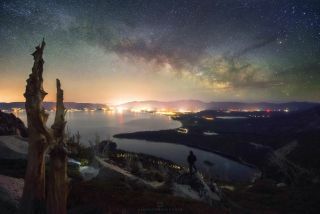 Photographer Justin Majeczky captured this stunning image of the Milky Way over South Lake Tahoe in June and shared it with Space.com. "With an average slope of 45 degrees, loose gravel and lots of rocks to traverse these conditions didn’t make things easier for us," Majeczky wrote in an email. "However after we set up camp and watched the once blue sky slowly fill with stars it sunk in that this trip was worth it. As soon as it got truly dark the Milky Way was just popping over the horizon as expected," he added. The Milky Way is a spiral galaxy, meaning multiple "arms" sprout from a central region and then swirl around it, like streams of water spiraling down a drain. It stretches between 100, 000 and 120,000 light-years in diameter. It is estimated that the galaxy has approximately 400 billion stars. At the center of our galaxy lies a gigantic black hole billions of times the size of the sun. Editor's note: If you have an amazing night sky photo you'd like to share with Space.com and our news partners for a possible story or image gallery, send images and comments in to managing editor Tariq Malik at spacephotos@space.com.